Welcome to our website! Here we introduces us HairStream, professional hair products maker for you! We have supply Brazilian hair, Indian hair, Chinese hair, Cambodian hair, European hair, Malayasian hair, Peruvian hair, etc. all over the world. 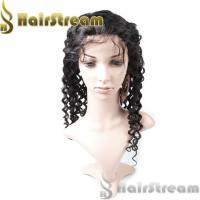 12-28 Inches in stock, other length could be customized. How To Measure Hair Correctly? We have more than 10 years of experience in Hairdressing Industry. 240 bags or 240 boxes ship by DHL every day. 28000 Kilogram/Kilograms per Month at least. Large Factory and Stock, Beautizan Hair Subsidiary company and many branch companies. You can always use the leftover hair later. If you are using hair over 18" lenght you might need another pack.If you are getting fusion or micro then you will need to consult your stylist.